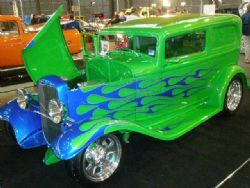 Each July I get out and see the Sydney Custom Auto Expo held in conjunction with Meguiars MotorEx at Sydney Olympic Park, Homebush. The show runs over the weekend and this year I was there before the doors opened on the Sunday to check out what classics, rods and car club displays were on show as well as the various vendors who attend this event. 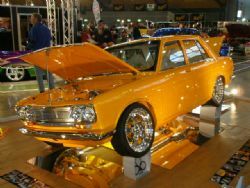 It is billed by the AHRC as the largest and most prestigious Hot Rod, Custom and Street Machine show in Australia and features the NSW State Title Show, the 2008 Grand Final for the Meguiars Superstars Series, the House of Kolor Inauguration and various other awards. There was a good queue waiting for the doors to open and the local coffee vendor had never seen it so good. Once inside the quality and calibre of the cars on show did not disappoint and there were a large number of well presented, big dollar rides on display under the main dome. We spent three hours having a good look around which is ample time to cover all on offer. Overall first impressions after being to all of these shows since its inception was that the number of cars on display and vendors was down from previous years and it appeared that the audience numbers coming through the doors was down also. There were not as many car clubs present this year and the overall numbers of cars from the clubs attending appeared to be less than in previous shows. The upside of this was it is easier to get around and there was more space to view what was on show. As mentioned earlier, the cars on show were all top shelf and I wouldn’t want the job of judging what was there as it would be extremely difficult to pick winners when every car could easily win any local car show event. Impeccable presentation combined with standout quality of workmanship was evident everywhere. 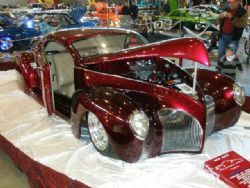 Cars ranged from concourse restorations to highly modified street machines and hot rods and the band on stage flooded the halls in some good old rock and roll music. There were also a number of outstanding custom bikes present along with some drag cars to add a bit of variety to the event. Cruising the halls were the mandatory leggy glamour’s hawking various vendors’ wares and obliging various spectators with a photo opportunity. If bling is your thing, you would not be disappointed. There were a number of people there that I knew and as I was leaving I had a chat to Joe who had his immaculate 57 Chevy convertible on display. He mentioned he had sent in his details to see if he could show his car and only received the paperwork to do so on the Tuesday prior to the event. This may be indicative of the overall attendance as for a show of this calibre it seemed that the organisation could have been better managed. I didn’t stick around for the award presentation but I am sure that whoever won would be very happy as the competition was hot. 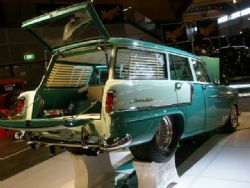 My pick from the show would have been the FC wagon (see photo) that sported a serious drive train and tubbed rear end that not only looked the goods but I am sure would go like the clappers as well.